In Power Query, you can include or exclude rows according to a specific value. A filtered column contains a small filter icon ( ) in the column header. Select the column that you need to filter. Click the down arrow ( ). Uncheck the Select All box to deselect all columns. Select the column values you want to include in your table. Notes: When you filter a column, only the top 1,000 distinct values in the column will load into the filter list. If there are 1,000 or more values in the column in Query Editor that you are filtering, a message will appears indicating that the list of values in the filter list may be incomplete, and the Load more link is shown. Click the Load more link to load another 1,000 distinct values. If exactly 1,000 distinct values are found again, the list is displayed with a message stating that the list could still be incomplete. If less than 1,000 distinct values are found, the full list of values is shown. 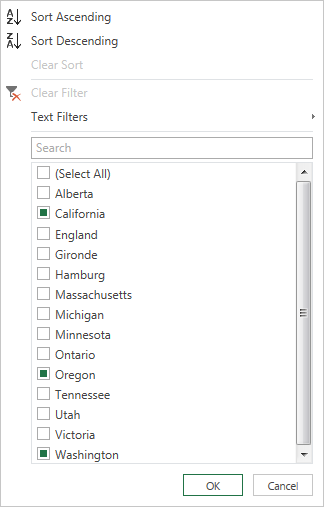 In addition to the To filter a column step, you can filter a Text value using the Text Filters context menu. Click the down arrow ( ) of the column containing a Text value you want to filter on. Click Text Filters, and click an equality type name of Equals, Does Not Equal, Begins With, Ends With, Contains, or Does Not Contain. In addition to the To filter a column step, you can filter a Number or Date/Time value using the Number Filters or Date/Time Filters menu. Click the down arrow ( ) of the column containing a Number or Date/Time value you want to filter on. Click Number Filters or Date/Time Filters, and an equality type name of Equals, Does Not Equal, Greater Than, Greater Than or Equal To, Less Than, or Less Than Or Equal To. To filter multiple columns, select an additional column, and repeat one of the column filter steps. For example, the Table.SelectRows() formula below returns a query filtered by State and Year. Filtering rows by position is similar to filtering rows by value, except that rows are kept or discarded according to their position in the table—rather than by cell values. Note: When you specify a range or pattern, the first data row in a table is row zero (0), not row one (1). You can create an Index column to display the row positions prior to removing rows. Right-click the table icon ( ). In the Keep Top Rows dialog box, enter the Number of rows. Click Keep Top 100 Rows. Click Keep Range of Rows. To define your range, in the Keep Range of Rows dialog box, enter the First row and Number of rows. In the Remove Top Rows dialog box, enter the Number of rows. To define your alternate row pattern, in the Remove Alternate Rows dialog box, enter the First row to remove, Number of rows to remove, and Number of rows to keep.